Great, My Plane's Crashing. Now What? Fear of flying is one of the most common phobias. Like almost everyone, I suffer from a touch of it. Even though I know logically that I’m safer in a commercial airliner than I am in my own bathtub, I still feel a twist in my stomach when the plane hits a sudden jolt of turbulence. Hearing the news about yesterday’s crash in Libya, which killed everyone aboard except a single Dutch boy, is unlikely to soothe anyone’s nerves. I’m sure that the next time I get jittery in flight, I’ll think about that boy and wonder: what could I do if this plane started to go down? If there’s only going to be one survivor, how can I increase the chances that it’s going to be me? I love the opening chapter of Max Frisch’s novel Homo Faber, in which the central character is riding as a passenger in an airplane when the pilot announces that the plane has developed engine trouble and will soon crash. While his fellow passengers weep and panic, Faber calmly begins to examine a map, to calculate their present location, and make plans for what to do once they have escaped from the wreckage. Of course, he has no way to know that he actually will escape from the wreckage, but it’s the only contingency worth planning for. Taking Action is a great way to avoid panicking. For one thing, it prevents you from engaging in “catastrophic thinking” that can quickly spiral into outright terror, by occupying your mental processes with the here and now. Also, it will help dispel the sense of helplessness that feeds fear. Sure, you’re strapped into a seat, far from the controls, unable to directly affect your fate. But there’s still a lot you can do to improve your odds. Start by tightening your seatbelt, the tighter the better — you’d be surprised how much slack can suddenly appear in a belt when you’re hanging upside down. Next, look at the laminated safety card in the seat pocket in front of you. Identify the nearest emergency exit. If you’re more than five rows away, and you can do so safely, consider moving closer — the closer the better. Studies have found that if you’re more than five rows away from an exit, your chances of surviving decrease dramatically. Tie your shoes tightly. If you’re in a cold climate, and you have extra clothes handy, put them on. If you’re over water, put your life jacket on now. If you’re with companions, reassure them that you’re all going to survive. Panic is infectious, but so is calm. And the calmer you are, the better your odds. Don’t just worry about what’s going to happen next; think a step or two beyond that. Before impact, assume the brace position. Not only will it increase your chances of surviving the impact, but it will reduce the probability that you’ll sustain a broken leg or other injuries that could prevent you from evacuating a burning or sinking aircraft. So now you’re on the ground, and well clear of the debris. The good news? You’re probably still alive. Statistics show that more than 95 percent of passengers involved in aircraft accidents survive. Hey, that was fun, let’s do it again! whenever i get on a plane, i count the number of rows from the nearest emergency exit to my seat. if there’s a crash, it might be smokey inside and you might not be able to see…but you’ll be able to feel and count. It doesn’t matter how safe flying is. Fear of flying will persist (at least for the person who is insecurely oriented to the world, an outgrowth of insecure attachment in childhood) unless all risk is ruled out. It doesn’t matter if a plane crashes once in a million flights or once in a hundred-million, the one that crashes stays active in the anxious flier’s mind unless it can be absolutely ruled out. A person with secure orientation thinks about what is most likely to happen. But the anxious flier thinks about what “could” happen, regardless of how remote, unless – as I said – absolutely ruled out. That’s because, to control emotions, the insecurely attached person does not built in an ability to auto-calm if things do wrong. So the person seeks to control things, to make sure they don’t go wrong. Unable to deal with things if they go wrong – because of inability to roll with the punches emotionally – things have to be “right”. Or, there has to be a way out if things go badly. Hypnotism is “hit or miss”. It can’t be relied on. Courses by pilots offer statistics on how safe flying. Great. But planes so sometimes crash. How does a person deal with the fear that your flight could be the statistic? Cognitive therapy – particularly that developed for fear of flying by Australian Claire Weekes – works for people whose feelings develop slowly, but not for those whose feelings develop too rapidly – or too intensely – for the the mind to remain clear enough to use the cognitive “tools”. What is needed is an automatic way to control feelings. We are born with half of the emotion regulation system in place, the half that revs us up. The half that calms us down does not exist at birth. By eighteen months a part of the brain develops that can let the child calm itself. The child memorizes the steps caregivers use to provide calming. If the steps are highly effective, the child can calm itself independently using the steps memorized. Obviously, caregivers – regardless of how much they care – vary in their ability to tune in the child and assure the child effectively. As a result, few of us get an optimal ability to calm ourselves. During teenage years, we tend to think bad things only happen to others. This youthful optimism gets us by for a few years without excessive anxiety. But as we mature, we realize something can happen to us. We then turn to strategies to keep anxiety when dealing with uncertainty under control. The strategies typically involve control and escape. Control: when control of anxiety is not naturally available, we depend on control of situations to avoid anxiety. When driving a car, we believe we can make everything work out alright. Though driving is not as safe as flying, we feel safer because the wheel is in our own, not someone else’s, hands. Escape: if there is a car accident, there may be a chance of surviving. 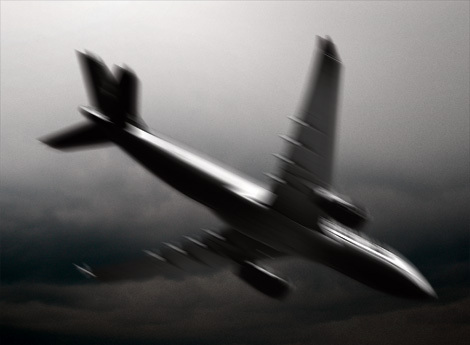 If a plane, people mistakenly believe that if something goes wrong they are doomed. In a plane, if something goes wrong, backup systems are used. Backup systems make flying safer than driving. But these systems are in the cockpit where they seem theoretical. Though backup systems provide greater safety in a plane than is available in a car, the systems are not as real to a passenger as a steering wheel is in the hands of a driver. Since the backup systems are not concrete enough to make passengers feel safe, many try to escape psychologically by keeping their thoughts elsewhere throughout the flight. If, due to turbulence, the person cannot keep the flight out of mind, there is no way to keep feelings under control. The feelings that develop when flying are caused by stress hormones, mainly adrenalin and cortisol. They rev you up. When you think “what if”, you get a “hit” of these stress hormones from each such thought. The build up of stress hormones produces claustrophobia, high anxiety or even panic. As both an airline captain and licensed therapist, I’ve worked for thirty years to develop more advanced ways to deal with flight anxiety. I’ve developed a way to prevent the release of adrenalin and cortisol by causing the release of oxytocin. Oxytocin shuts down the amygdala, the part of the brain that triggers the release of the hormones that cause fear. We cause the release of oxytocin by linking each thing that happens on a flight, and each thing you worry about, to the memory of a moment that causes oxytocin to be released. Once the links are established between an oxytocin-producing moment and troublesome moments of flight, high anxiety and panic are automatically controlled. This is an advanced way of controlling the feelings, and it was not possible to do this until research using brain scan technology showed us how the brain works. The way I understand the cause and cure of flight anxiety is posted on youtube under my name, Capt Tom Bunn. Thanks for the very practical tips! Having been on over 6 different commercial flights with three different airlines last month, I’ve been trying to mentally practice the steps I would take in an emergency. I think it all starts with the type of clothes you wear on the flight. Watching fellow passengers totter onto the plane with tight skirt and stilletoes, I dread to think how they would manage an emergency exit. Flat shoes and cotton tops are best, I’ve heard. I’m also wondering whether I shouldn’t wear jeans because they sink pretty convincingly. It only takes one person reaching for their overhead cabin luggage to clog up the isle. I would assume that’s a contributing factor when you’re talking about 5 rows back from the exit reduces your escape chances. Thanks again for the tips. I’ll review this before my next flight. Being one of that 95% who survive I can vouch for the soundness of Jeff’s advice. I was able to concentrate on working out what was most likely to happen, and as a result I stayed calm. People around me noticed, asked why I didn’t seem scared, and we talked ourselves round to planning for survival. When the (very mild and ultimately not very scary) crash came, everyone realised we had survived and actually stayed quite calm. It’s not really a fun experience, but it certainly was better than panicking! Thanks for the tips. I don’t know if we can always keep it less than five rows from the exit though. But thanks! It’s so practical.